If you are overweight or obese, weight loss is typically encouraged, as it reduces your risk of high cholesterol, high blood pressure, diabetes, heart disease, joint disease and certain types of cancers. For most people, weight loss can be accomplished gradually and without significant complications. 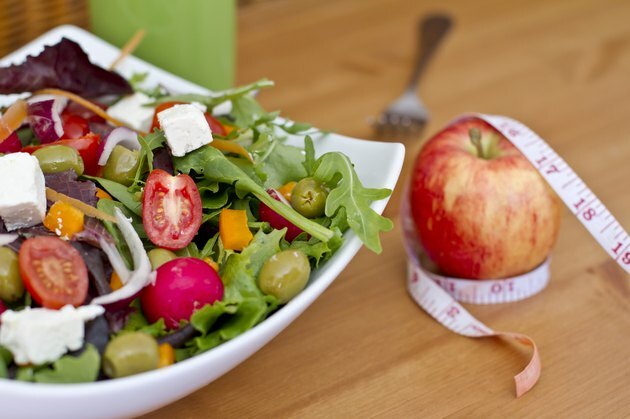 Rapid weight loss or weight loss related to very low calorie diets, however, can have adverse effects. Your physician may recommend weight loss if you are overweight or obese, as characterized as a body mass index over 25. Body mass index (BMI) is a formula that utilizes your height and weight to determine whether your weight is too low, within the healthy range or overweight or obese. If your BMI is 25 or above, your physician will likely recommend a low-calorie diet of approximately 1,200 calories per day. Very low calorie diets, or VLCDs, involve the consumption of 800 calories or less and are recommended only for moderately to severely obese patients. This results in a weight loss of approximately 3 to 5 pounds per week. According to the Cleveland Clinic, rapid weight loss decreases the gallbladder's ability to contract bile and results in an increased risk of formation of gallstones. The risk of this adverse effect can be decreased by losing weight more slowly. Additionally, it is important to remember that the risk of gallstones is also increased in obesity. Weight loss diets that emphasize one food group or one food type can result in poor nutrition. A diet that eliminates carbohydrates, for example, will reduce your intake of soluble fiber, vitamin C, antioxidants and many of the other vitamins available in fruits and vegetables. Poor nutrition can result in increased susceptibility to infections as well as weakened bones and even psychological problems. This effect can be avoided by adhering to a diet that contains a wide variety of foods in moderation rather than strictly avoiding one or more food groups. While weight loss can have negative effects, they can largely be avoided by adhering to a well-balanced diet that emphasizes whole grains, fruits, vegetables, low-fat dairy products and lean meats. Consuming these foods in moderation and avoiding saturated fat and sugary processed food products can help you lose weight gradually and optimize your health. If you are having difficulty with your weight loss, consulting a nutritionist may help you optimize your diet and avoid any adverse effects. Additionally, a psychologist or psychiatrist that specializes in eating disorders should be involved if you have a history of this issue and are trying to lose weight.